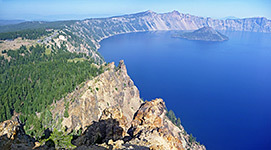 Crater Lake National Park has three trails that climb to summits overlooking the lake, of which one (Mount Scott) is 2 miles from the rim so views of the water are more restricted, but the other two are right on the edge; these are the 0.8 mile Watchman Trail and the 1.7 mile Garfield Peak Trail. This latter is quite steep, gaining 1,000 feet in elevation (second in the park only to Mount Scott), but popular, partly because it starts right next to Crater Lake Lodge, on one of the lowest parts of the south rim. 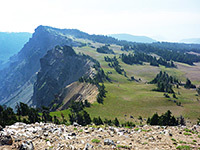 The path climbs to an isolated, mostly treeless 8,054 foot summit, the fourth highest point on the rim, and although most runs just below the crest and so overlooks the forested lands in the south, there are many places where the lake is in full view. 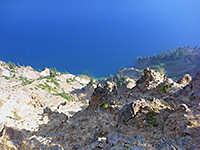 The panorama from the summit includes the extremely steep, jagged and colorful slopes leading down to the water, the grassy hillsides further east, below the Eagle Crags, and the lake itself, with the prominent outline of Wizard Island just 2.5 miles away. The path is wide and well used, and the round trip takes around 90 minutes. The varied terrain along the trail - a mix of trees, grass and rocky outcrops - provides habitats for a good selection of wildflowers. 13 views along the Garfield Peak Trail. 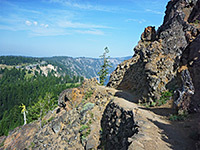 There is no shortage of parking places for the Garfield Peak Trail, along the wide road leading to Crater Lake Lodge, just beyond Rim Village and 7 miles from the south entrance station. The path - initially the paved Rim Trail - starts from the east side of the lodge. 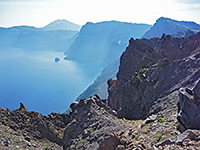 East of Crater Lake Lodge, the Rim Trail follows right beside the crater edge for 800 feet, the views partly obscured by trees, to a final overlook, where a trailhead sign marks the start of the route to Garfield Peak. This path passes through a thin belt of woodland and starts to climb steadily, along a section of the rim known as Castle Crest; it crosses a meadow and reaches the very edge of the rim then moves away slightly, and generally stays just below, in places running at the base of a line of jagged cliffs and pinnacles. Some parts are lightly wooded, but the majority of the surroundings are open, and grassy. The trail has a few small switchbacks and one larger bend as the route moves further away from the rim to avoid a large protruding rock, the top of which (a short walk off-trail) gives the best views - of Wizard Island, and back along the rim to the lodge. The final section of the trail is briefly level then bends south again and ends by turning back north to the summit, which is fairly flat for 100 feet and has a few trees to the west, partly blocking the view, but the vista in the other directions is entirely unobstructed. Rocks around the latter portion of the trail are generally more weathered and jagged than those lower down, though to the east, the line of outcrops gives way to smoother slopes, where the undulating grassy hills to the south extend right up to the rim. There is no continuation trail, but it would be easy to walk further east, perhaps climbing to the slightly higher summit of Albright Peak, one mile away. To the north, the inner slopes of the crater are almost entirely lacking vegetation, and especially steep, dropping almost 2,000 feet to the lake in less than half a mile.